This gallery explores the world of compact kitchen designs. Small kitchens can be a challenge to balance style and necessity and still get everything you want in to a tight space. Here are some stylish and contemporary small kitchen designs to get your ideas flowing. The kitchen shown above efficiently uses the limited space it has, maximizing storage without sacrificing a working area. It also has an interesting choice of finish. 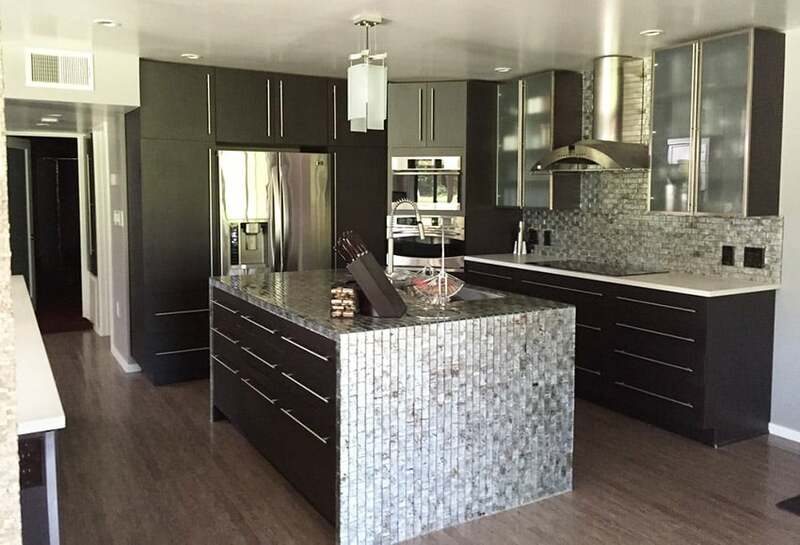 It uses mother of pearl tiles of the back splash and, interestingly, the counter top of the kitchen island. 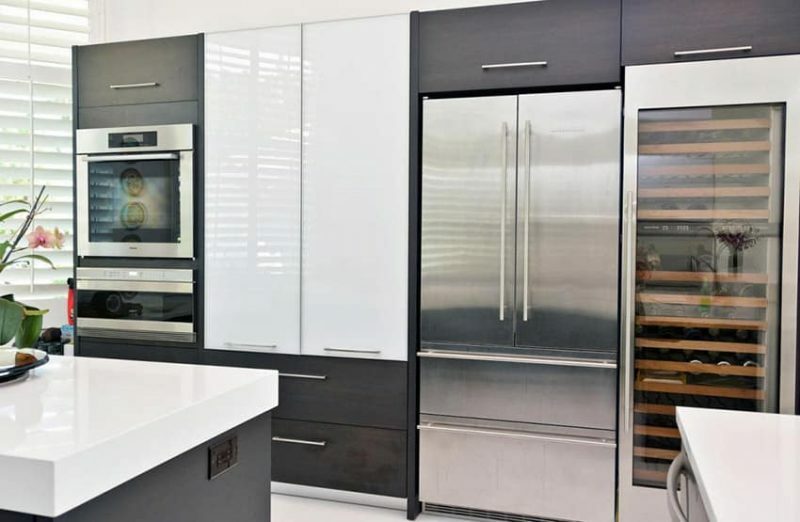 For the rest of the kitchen, it goes for a more modern minimalist style – dark wengue laminated doors and carcass with modern stainless steel pulls. Charming paneled solid walnut kitchen cabinets were used for this small kitchen, but given a modern twist by using a more modern material choice for the counter top and the backsplash, in addition to the bold orange walls. 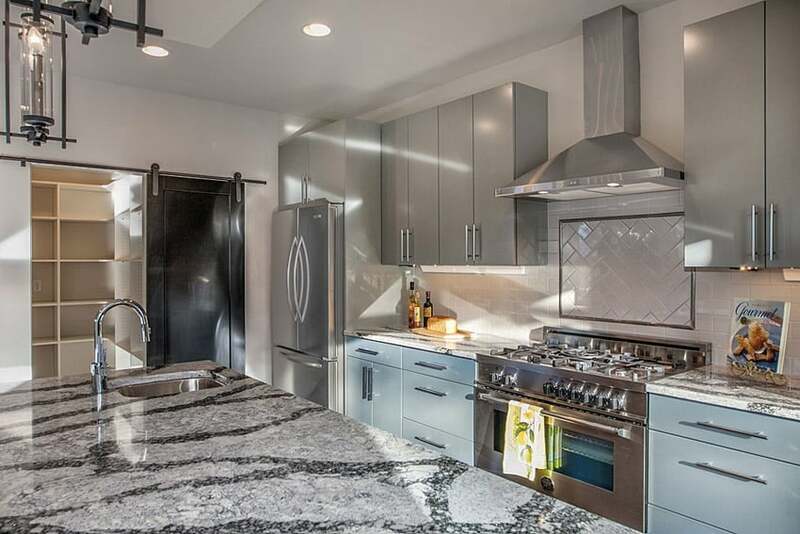 Gray granite with plain profile was used for the counter top, while the back splash uses glass mosaic tiles in gray and white. Despite the small size, this kitchen keeps that traditional country vibe going with its dark orange walls and walnut kitchen cabinets. It even has a stucco finish sloped ceiling and accessories displayed on top of the overhead cabinets to complete the look. 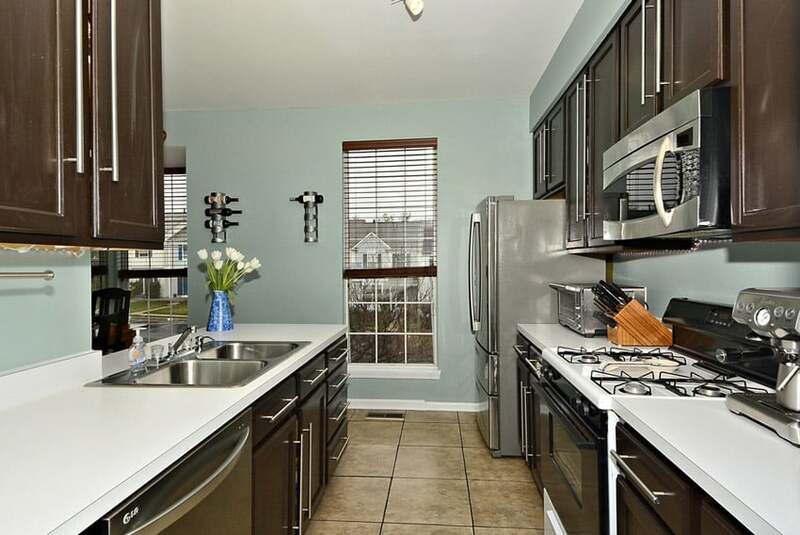 Given the small space, this kitchen offers a unique layout. Cabinets in natural beech wood finish was place against gray walls making it stand-out from the dark background, while the kitchen island with dark walnut base and white solid surface counter top was placed diagonally instead of parallel to the main kitchen cabinet. Modular cabinets is a popular and practical choice especially when you have very limited space. 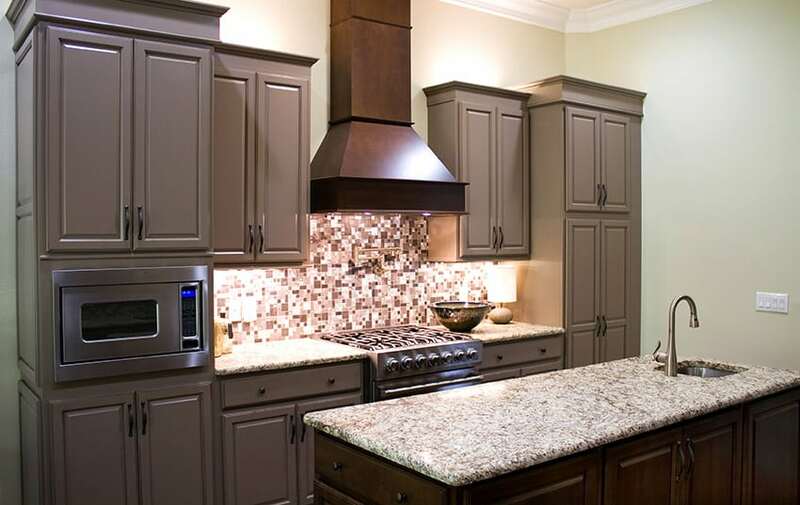 This kitchen uses modular cabinets with traditional design/profiles in mocha brown finish for a more modern look. This is paired with brown mosaic tiles and salt & pepper granite. Despite the small size, it manages to fit in a small kitchen island with a modular walnut base cabinet. Going for a traditional vibe, this kitchen manages to fit in a faux stone oven by placing a niche surrounded by masonry stone cladding. 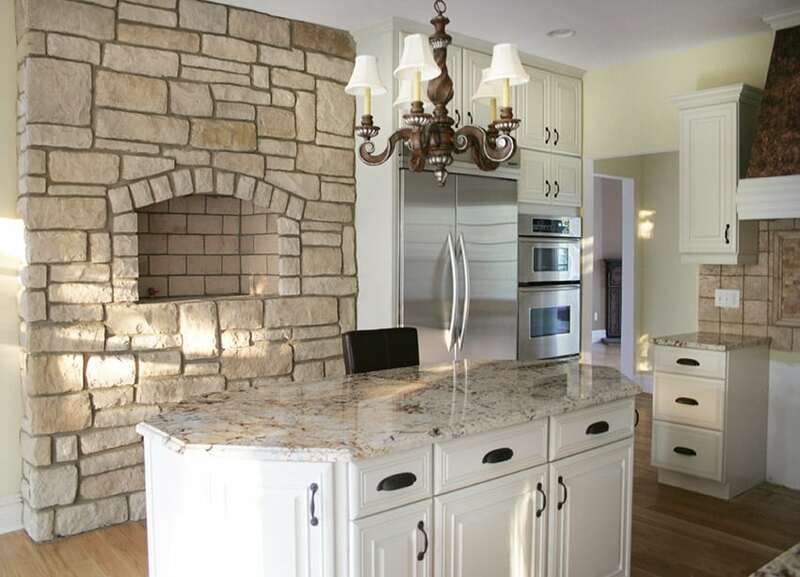 The limestone masonry look great against the lime yellow walls and also matches the granite used on the counters. The kitchen cabinets are modular with traditional style profiles and hardware. Traditional kitchens often look heavy and space-consuming, but with right planning, you can make traditional kitchen style work even on small spaces like this example. Natural stone floors with a neutral light cream color was used, and for the kitchen cabinets, it’s a combination of dark walnut for the main cabinets and wengue for the kitchen island. The fridge face was covered with the same style as the cabinet doors to “conceal” it and create a more uniform surface. The design also manages to squeeze in a range hood cover clad with faux masonry and a kitchen island with a bar counter. 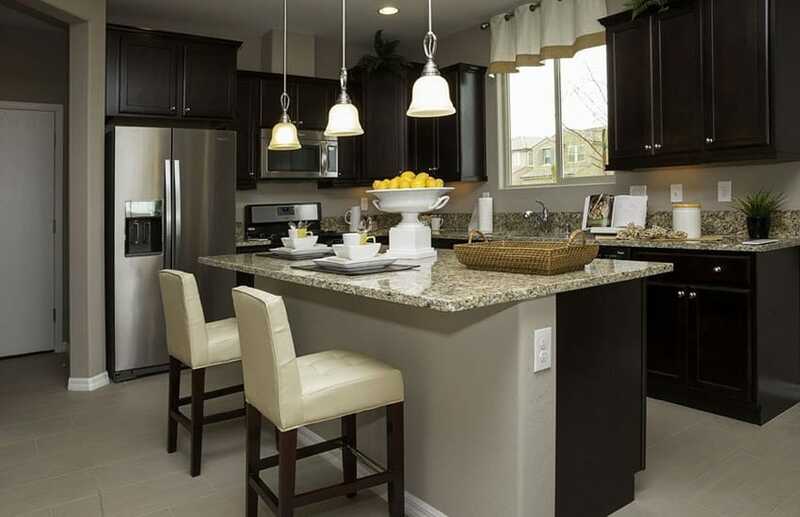 Lighter colors were use in this kitchen to make it look more spacious and bright. 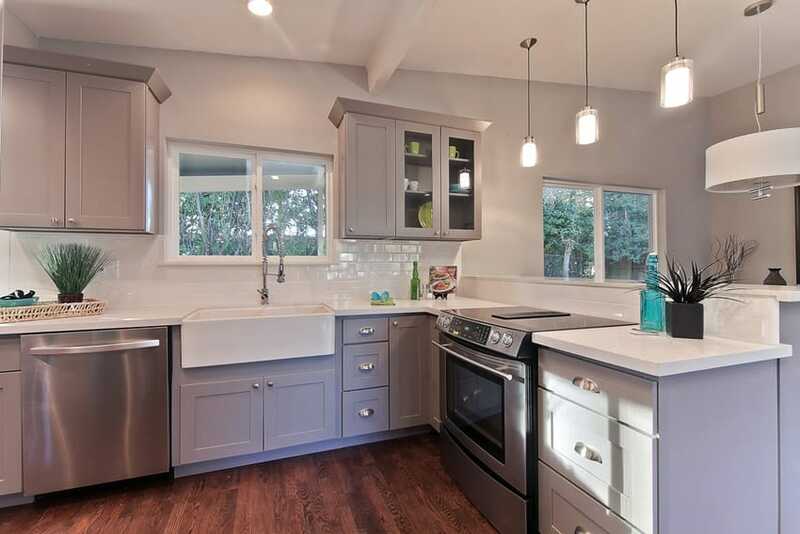 It features a combination of light gray overhead cabinets and powder blue base cabinets with a unique stone countertop. The combination of colors look fresh and modern, giving the space clean lines and crisp edges typical to modern designs. This kitchen combines modern aesthetics with rustic-inspired finishes. The sole cabinets have antiqued oak finish and uses plain white solid surface for a cleaner homogeneous surface. For the back splash, gray marble subway tiles were used adding a bit of texture and pattern to the space. This compact kitchen space features 2 walls fully utilized with kitchen cabinets, efficiently using the limited available space. The walls have a nice shade of light sage green color, giving a cool background which also helps the Mahogany finish cabinets stand out. A transitional modern kitchen space which uses a combination of grays to create this relaxed compact kitchen space. 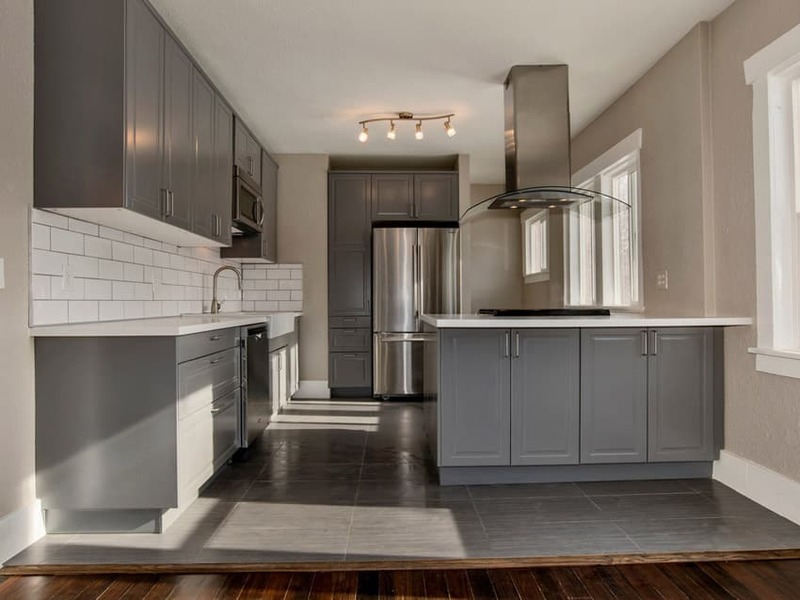 Walls were painted in a warm gray color which looks perfect with the gray kitchen cabinets. 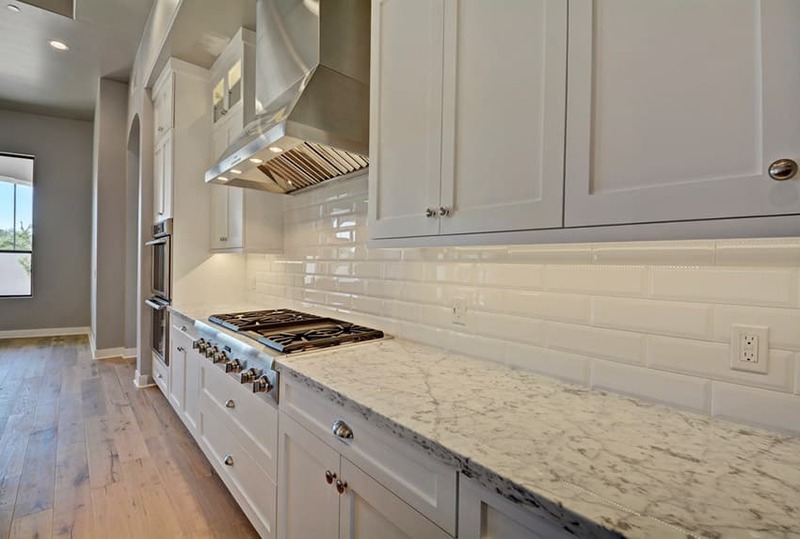 Completing the modern feel of the space is the white counters and white subway tiles. 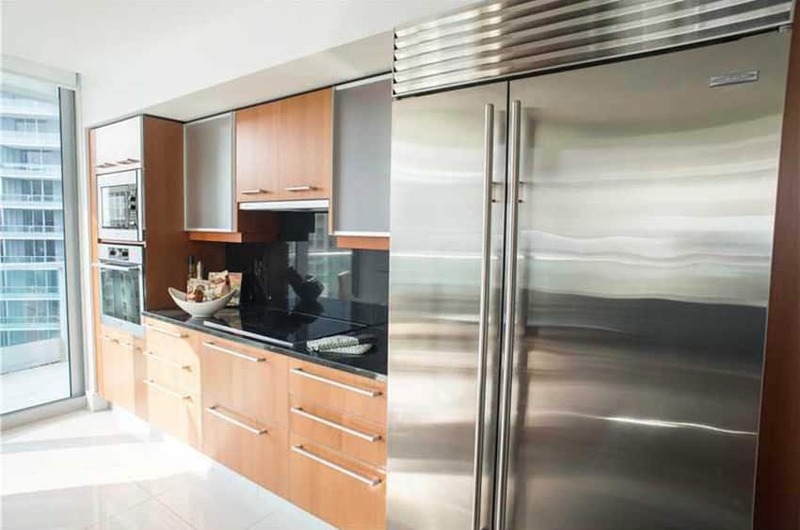 Utilizing all available wall space, this kitchen was efficiently planned to be able to create a full functioning kitchen with sufficient storage and work areas. 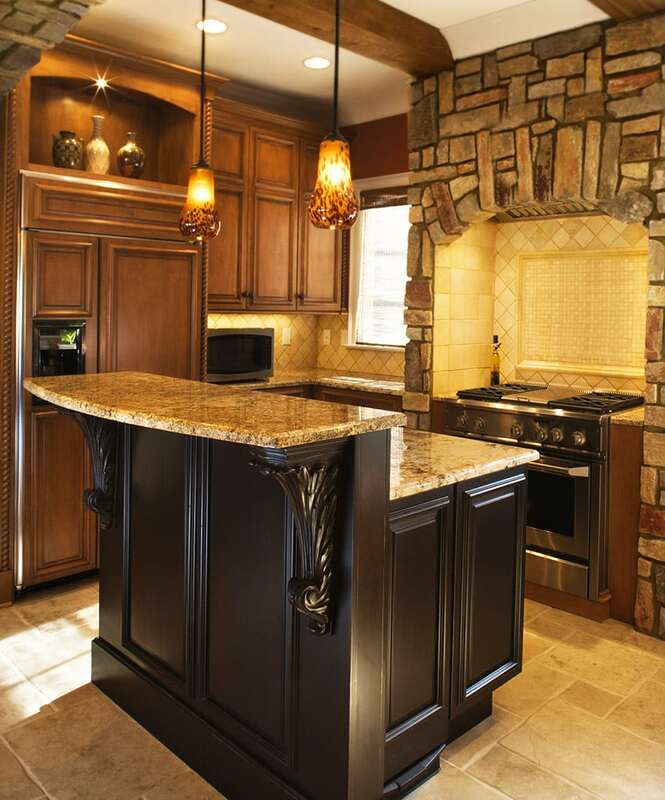 Kitchen cabinets is solid wood in dark wengue finish and topped with classic granite counters. 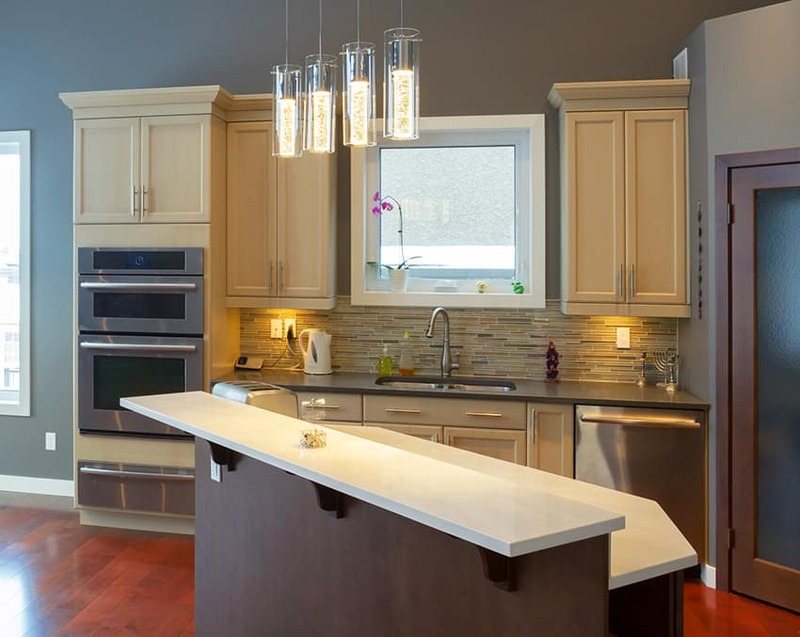 Lilac is an interesting color choice for this modern kitchen, giving it a cool and light feel. It looks perfect against the light gray walls, while the white solid surface and white subway back splash tiles gives it a refreshing modern retro touch. 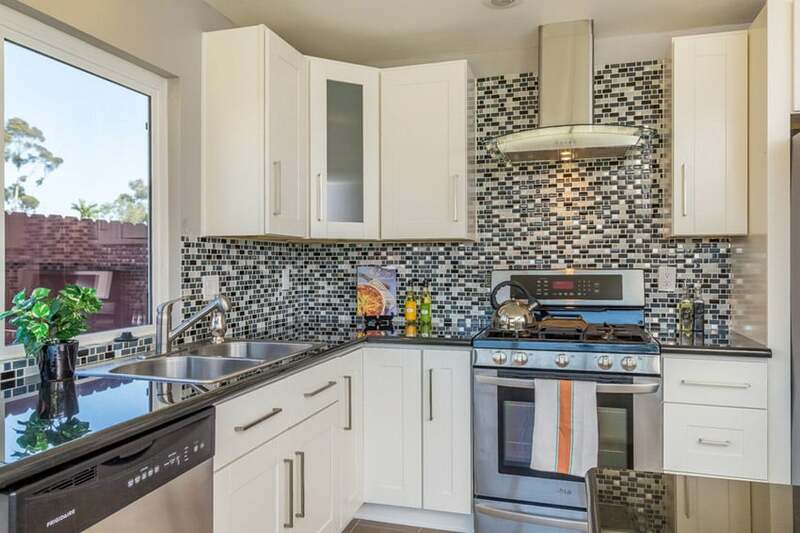 This compact sized kitchen uses white painted cabinets, making it look plain & simple, but the backsplash tile of choice compensates the plain surfaces as it has a combination of blue, gray and white hues, giving the space an interesting abstract pattern and texture. Emphasizing the beauty of teak wood, the kitchen cabinets retains its natural color and simply oils it to add a soft sheen finish. The subtle red orange of the cabinets compliments the light yellow of the maple wood floors, while the plain white walls helps balance and tone down the wood finishes. One of the advantages of having an open layout is that you will be able to use darker colors without making it look too heavy. 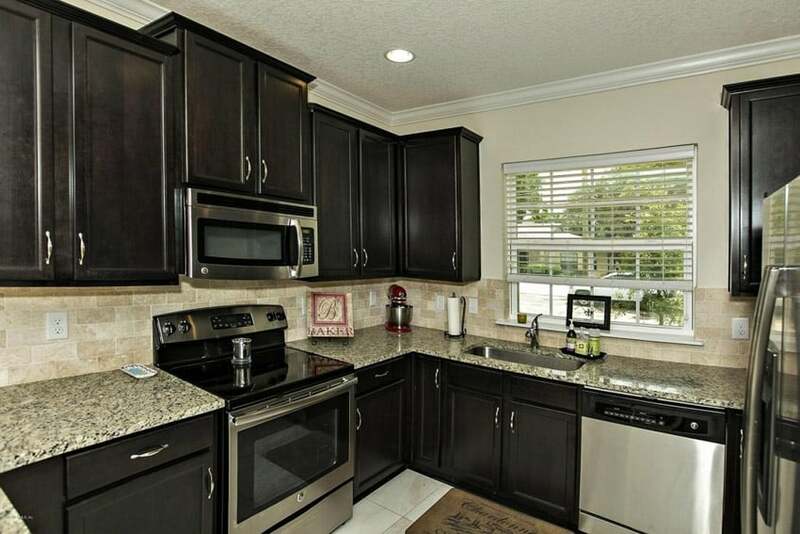 The gray walls provide a nice neutral background for the Mahogany finish cabinets and the cream granite counter top. This kitchen goes for a classic country-inspired look. 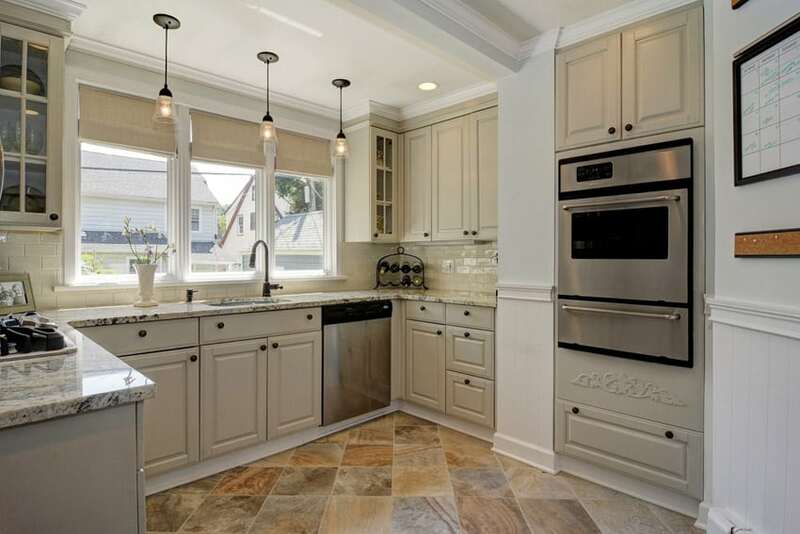 It uses cream finished kitchen cabinets for that “old” look which matches the color used on the subway tiles. The countertop material is marble, giving it an elegant look appropriate for the overall kitchen design. Due to the limited space, this kitchen goes for a lighter color scheme. 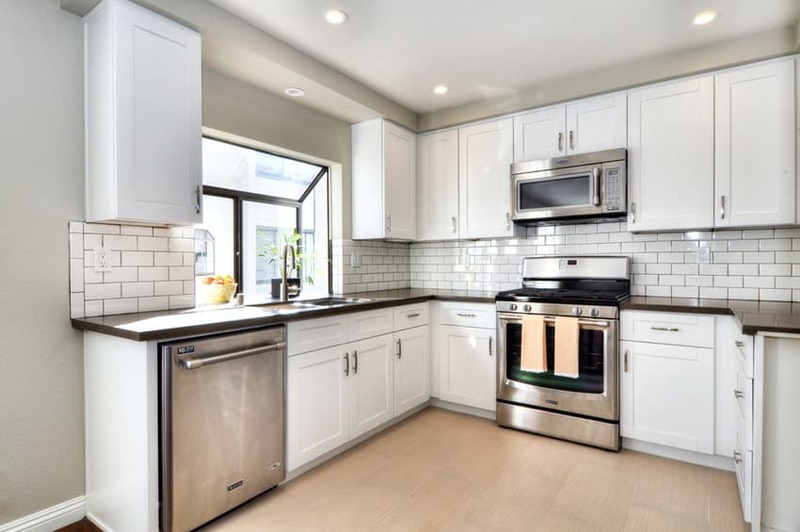 It uses all white cabinets with black solid surface placed against warm gray walls and white subway tiles. The light maple engineered wood floors adds a touch of warmth to the space, and helps make it look homier. The ceiling of this space uses solid light oak, giving the interiors a country feel as it is paired with light gray walls. 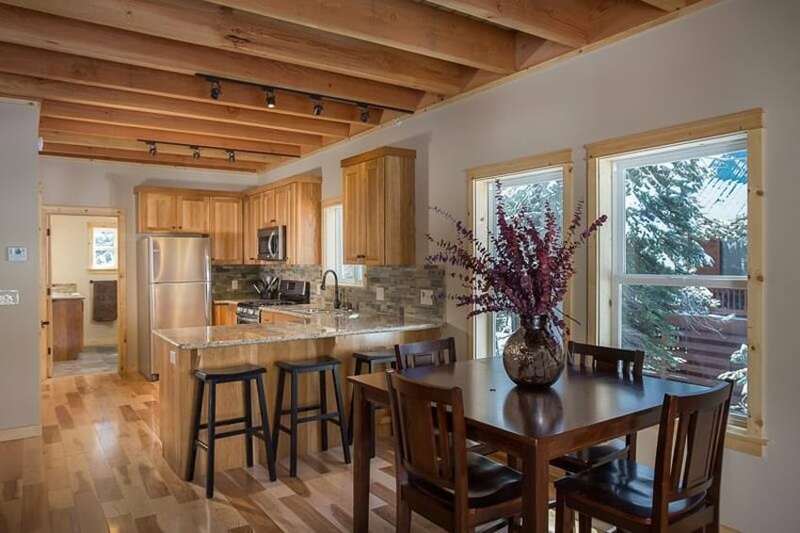 As the ceiling is already busy with wood elements, the wood used on the kitchen cabinets simply matches the ceiling wood beams, creating a well put-together look. Clean and modern definitely encapsulates the look this modern kitchen is trying to achieve. 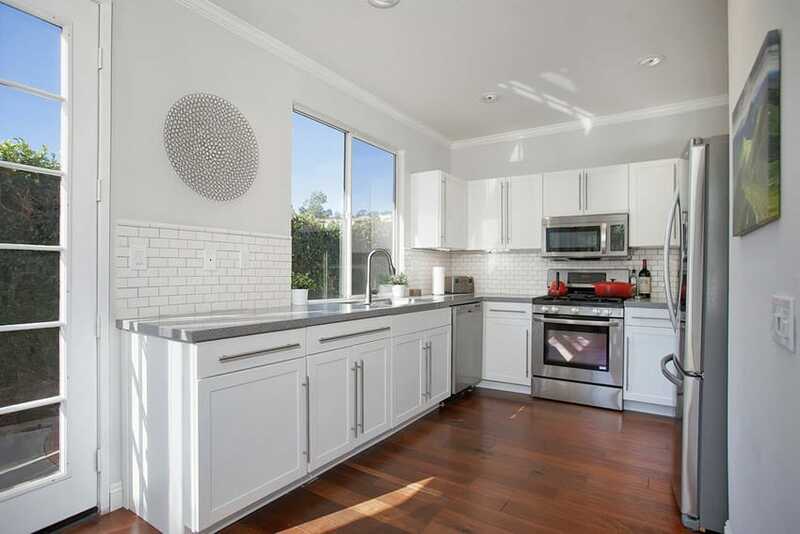 Mahogany floors and white walls provide a great background surface to the white kitchen cabinets. 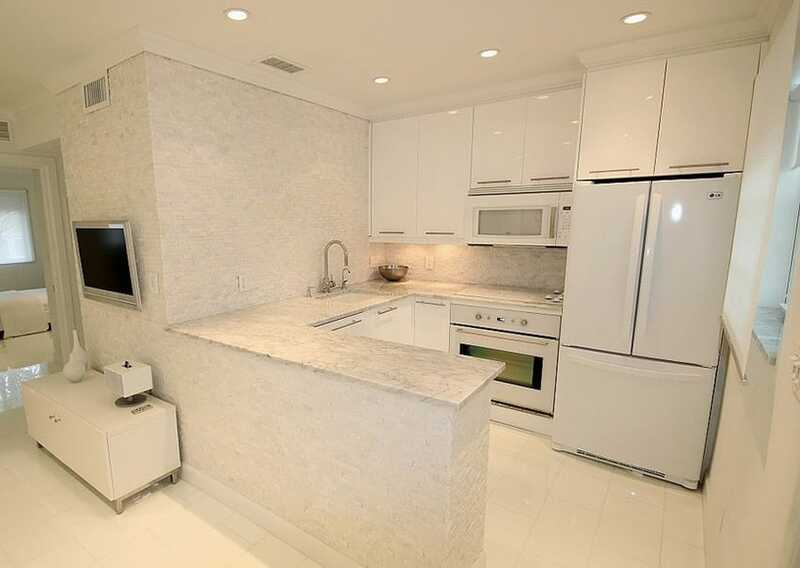 Gray solid surface was the counter top material of choice, giving a subtle contrast against the white subway tiles. Despite the limited space, this compact kitchen manages to fit in kitchen essentials, efficiently fitting in a large two door fridge despite the small space. 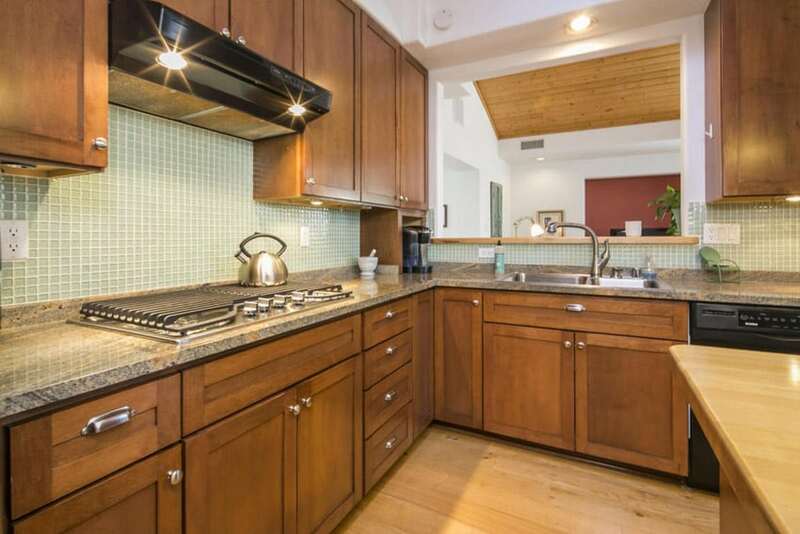 To match with the modern architecture, the kitchen cabinets uses teak wood laminate finish and paired it with black granite counter top & backsplash for a more seamless look. Maximizing the limited space available, the kitchen cabinets uses the full height of the walls and uses it for additional storage. 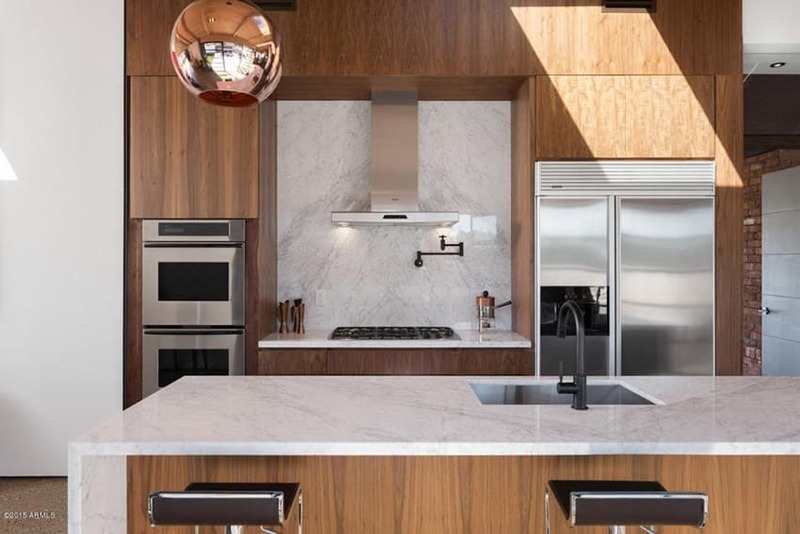 Teak wood laminates were used to give it a warmer feel but still keeping to the modern aesthetics of the space and for the backsplash and matching countertop Carrara marble was used giving it a simple yet elegant appeal. Clean, straightforward and very functional, this kitchen strips it down to essentials, using only essential pieces to complete this design. White was the cor of choice for both the walls and the kitchen cabinets, while the backsplash uses light cream granite, adding a very subtle color contrast. Even with limited space available, this kitchen manages to fit in all kitchen essentials, efficiently planning the kitchen to create excellent workflow. It also utilizes one wall for a full pantry storage, giving you more room for work tops. 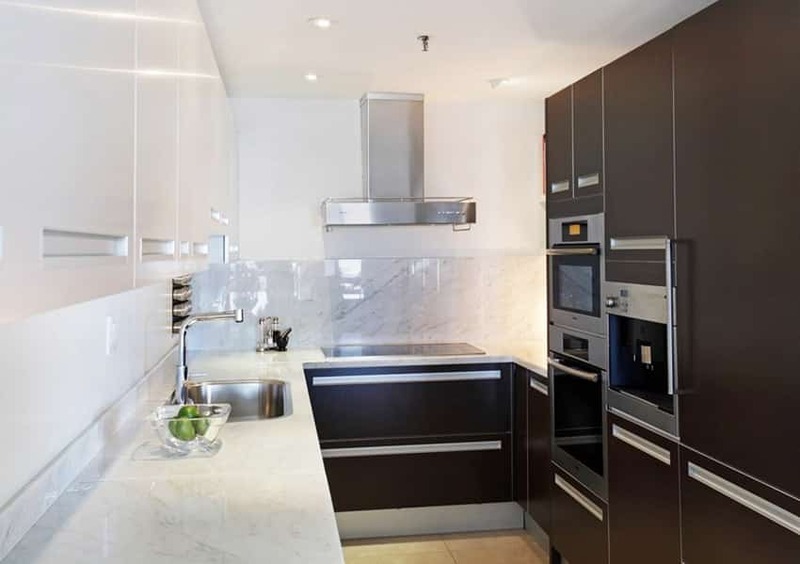 Going for a modern contemporary look, base cabinets were laminated in dark Mahogany while the overhead uses white, making it almost blend against the white walls if not for its stainless steel handles. Compact kitchen designs with islands can be effective for food preparation and make an efficient kitchen work triangle. 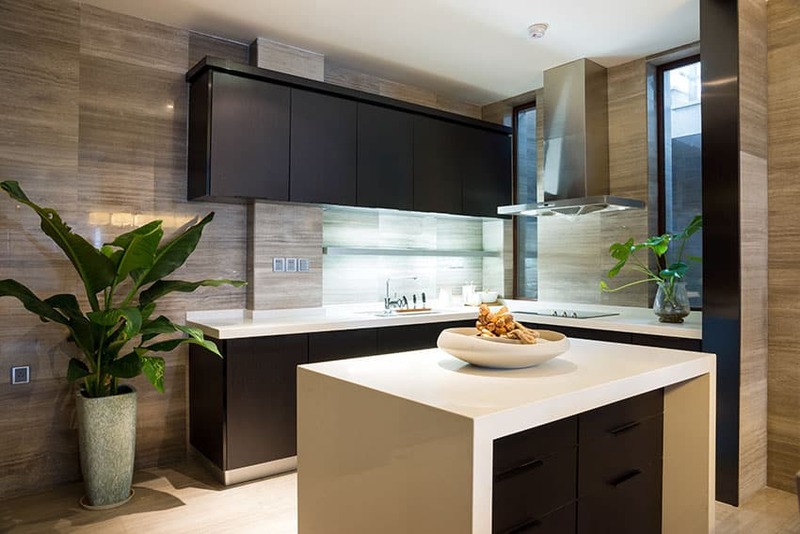 The small modern kitchen space with island features white solid surface corian countertops and dark brown cabinets. Floating upper cabinets and under island cupboards offer additional storage space for cooking utensils and pots & pans. A balance of classic beauty and modern simplicity, this kitchen has the right balance of both modern & classic elements. 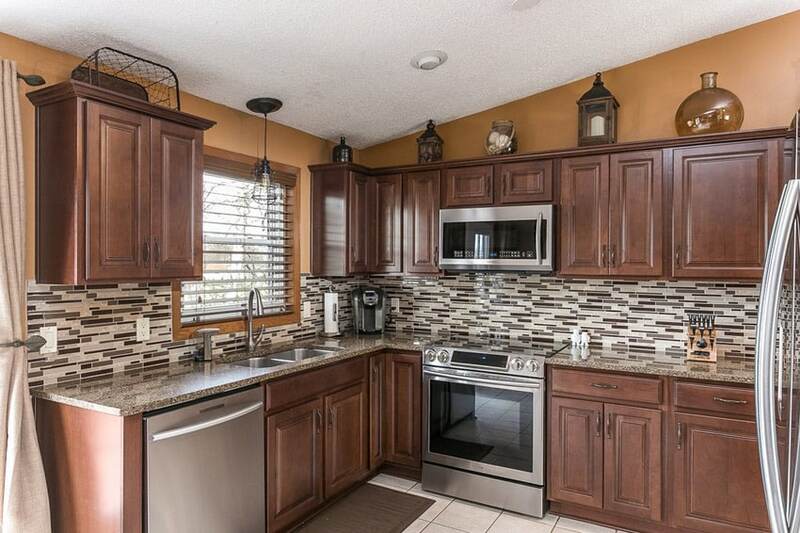 Cabinets used are of traditional style in dark wengue finish which really stands out against the plain white walls. For the counter top, gorgeous slabs of white soapstone was used and paired with glass subway tiles for the backsplash with subtle yellow green undertones. Going for a modern country look, this kitchen uses a simple cabinet profile painted in a flat white color. 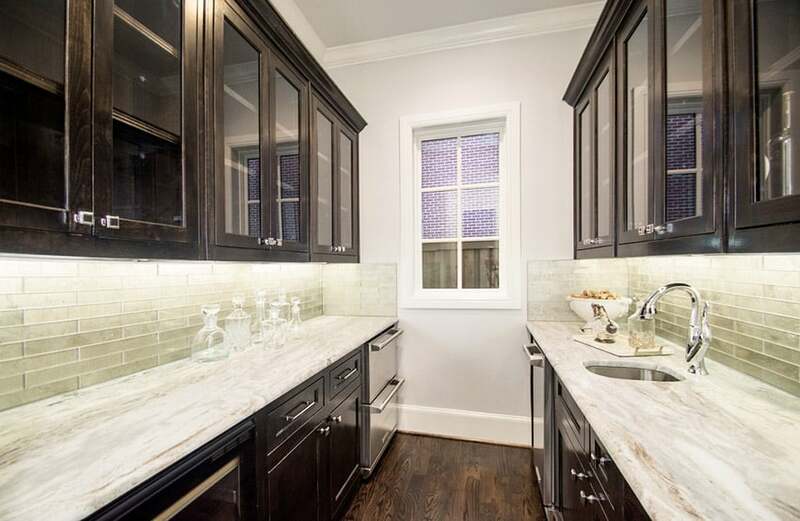 This was paired with white marble with prominent gray graining and white beveled subway tiles. This design looks like a timeless beauty which would look great in both modern and traditional style spaces. This U-shaped kitchen was able to avoid making it look smaller and stuffy by going for an all white color scheme. 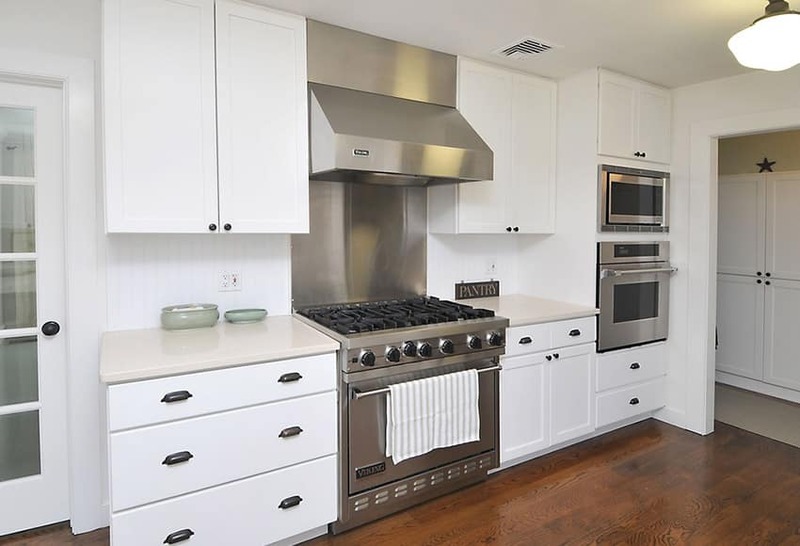 Even the appliances used were a white to keep the minimalist look and even tops it with elegant Carrara marble to add a little pattern without moving away for the color scheme. Typical of modern kitchens, this design goes for an all white color scheme which proves to be beneficial due to the very small space and the absence of natural lighting. 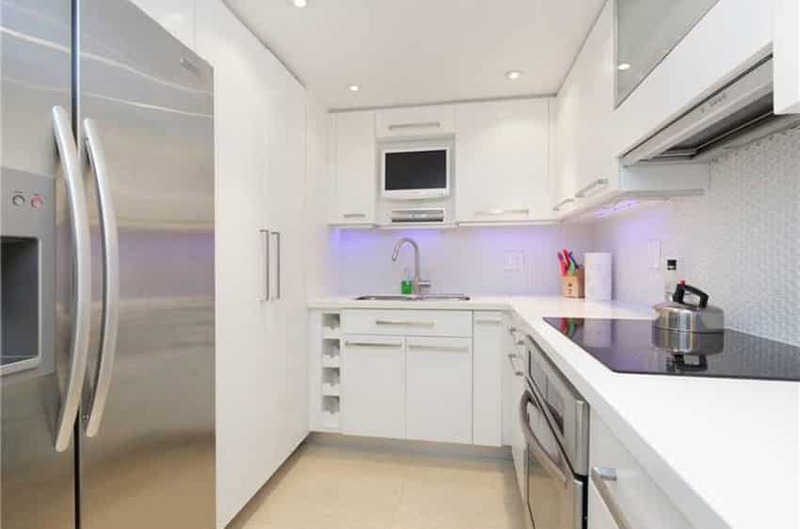 All cabinets were laminated in glossy white and topped with seamless white solid surface. It uses textured ceramic tiles for the backsplash to add a subtle touch of texture and pattern, while artificial lights were efficiently used to compensate for the lack of natural light. This compact kitchen makes a big statement even with its smaller size. 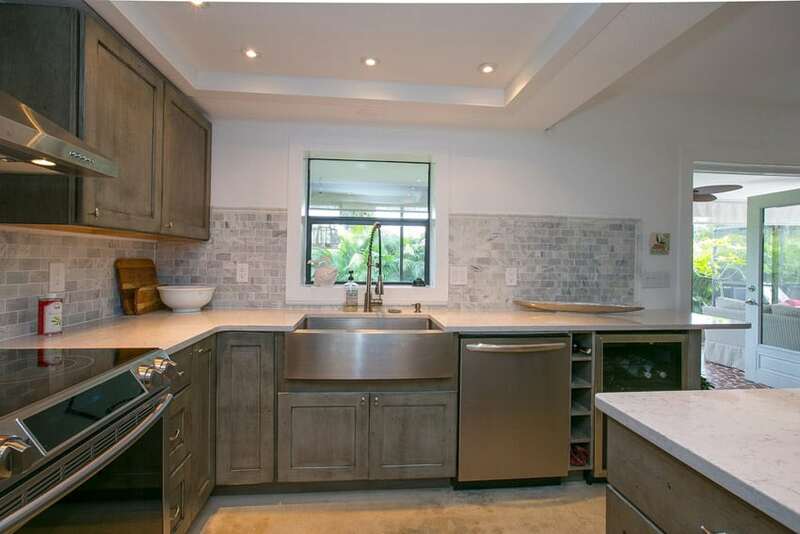 It features a contemporary design with limestone counters and peppercorn painted cabinets. There are also some high gloss white cabinets for a little contrast. Not to be forgotten is the large beverage/ wine fridge next to the stainless steel refrigerator.